If you only know Betty Webb's books from the Lena Jones mysteries, you know the dark side of her writing. If you want to know the fun side, you'll have to check out her zoo books. The latest one, The Koala of Death, has all of the elements that made the first book in the series, The Anteater of Death, so successful. If you're looking for mystery, interesting characters, and fascinating animals, combined with some humor, you won't go wrong with The Koala of Death. Theodora "Teddy" Bentley is a zookeeper who lives on a houseboat in Gunn Landing Harbor in California. She headed home early after a party on one of the other boats, but that doesn't mean she slept well enough to face the body she found bumping against her boat in the morning. When the body turned out to be "Koala Kate," the new koala keeper at the Gunn Zoo, Teddy's troubles were just beginning. Now she was involved in another murder case, to the despair of her wealthy mother, and the frustration of her boyfriend, Sheriff Joe Rejas. And, the zoo now needed a PR person to appear on a weekly TV show, so Teddy was drafted for that job. Teddy Bentley has a very complicated life. Her family was always wealthy, but her father embezzled millions, and left for Costa Rica. Her mother,Caro, still loved him, but found ways to recover her money and pride, by marrying one man after another, each wealthier than the previous one. And, despite Teddy's relationship with Joe, Caro was always trying to fix her daughter up with eligible, wealthy men. Teddy values her independence, her life on the houseboat, and her job at the zoo, but a second murder drives her back home. She might be forced to live with her mother, but she's determined to continue to dig into the death of her friends. Teddy is a likable, intelligent amateur sleuth. Throw in her sense of humor when it comes to her beloved animals, and it's a pleasure to read about her. The book is filled with a wealth of material about various animals as Teddy and the zoo staff promote them on TV, and raise money to save endangered animals. Readers who loves animals will have to respect Teddy's knowledge. She does have a sense of humor about the animals, though, and she enjoys their antics as she copes with a self-important TV journalist. And, her relationship with the koala, Wanchu, is wonderful to see. Despite warnings from Joe and Caro, Teddy and the Gunn Zoo are once more deeply involved in a murder investigation. Readers will only say thank heavens Teddy cares enough to investigate. 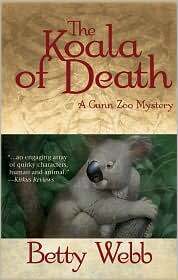 Betty Webb's zoo mysteries, The Anteater of Death, and, now, The Koala of Death, are enjoyable treats. FTC Full Disclosure - I requested this ARC from the publisher so I could read and review it. Sounds like a great book! I haven't read Betty's zoo series...the inclusion of the animals sounds like fun. Betty volunteers at the Phoenix Zoo, and she does a great job with the animals in these books. She brings them to life. And, I really like Teddy Bentley. These are the books Betty Webb writes when the Lena Jones books become too dark for her. I enjoy the zoo mysteries. I think you'll like Teddy and her unusual family.